Breakfast is the most important meal of the day and make-ahead recipes like this overnight oats are a convenient and healthy option too. 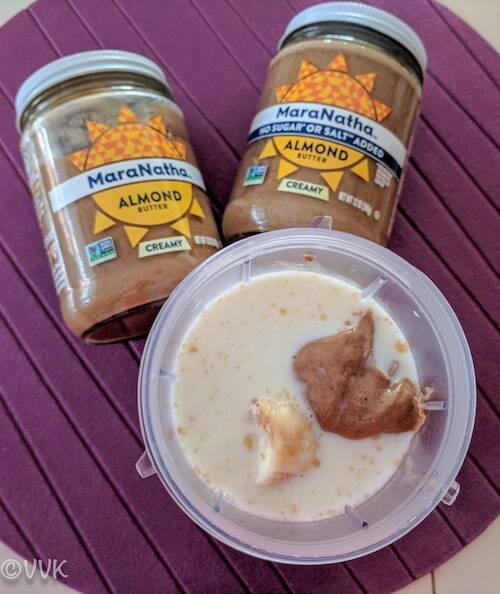 Today I am going to share how to prepare overnight oats with almond butter, precisely Maranatha No Stir Almond Butter that I bought from Walmart and banana with no additional sugar added. It’s no secret, and we all know about the health benefits of the whole grain food Oats. 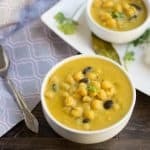 It’s gluten-free, an excellent source of fiber, antioxidants, helps to reduce blood sugar levels and reduce the risk of heart disease. It also aids in weight loss. These are a few of the zillion benefits of oats. 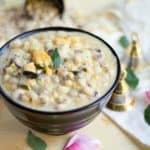 I always look ways for incorporating fiber-rich oats in our day to day life and this overnight oats is one among the best option. Healthy and delicious as well. We all know that almonds help lower blood sugar levels, blood pressure, and cholesterol levels as well. The healthy fat in almonds does all the magic. 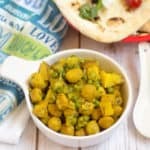 Wondering how to incorporate almonds into everyday food? The answer is MaraNatha Almond Butter. 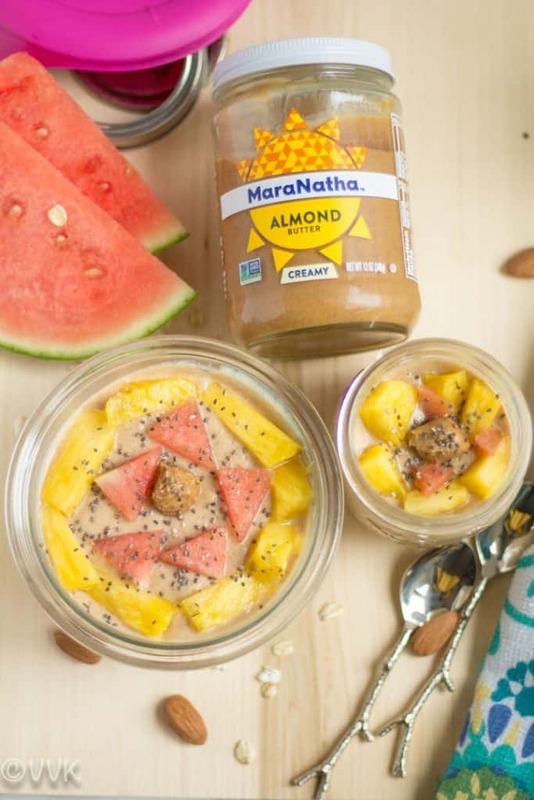 Of all the brands, I love MaraNatha nut butter brand because of their superior taste and rich and creamy spreadable texture. It’s a perfect choice for all the nut-lovers who enjoy a healthy lifestyle. 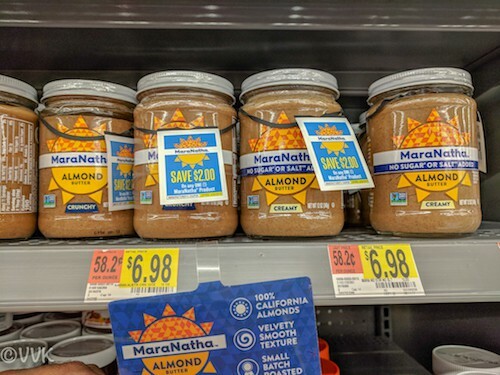 MaraNatha also offers no salt, and no additives added almond butter. Isn’t that great? I know it can be used as a spread and in the sandwich but guess how I ate? I dug-in directly with a spoon and oh boy I was in food heaven. PS: Ensure you refrigerate the MaraNatha Almond Butter after opening. 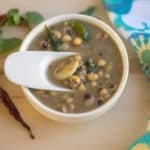 Wondering how I used the almond butter? Of course in my favorite overnight oats. I love the combination of nut butter and banana. 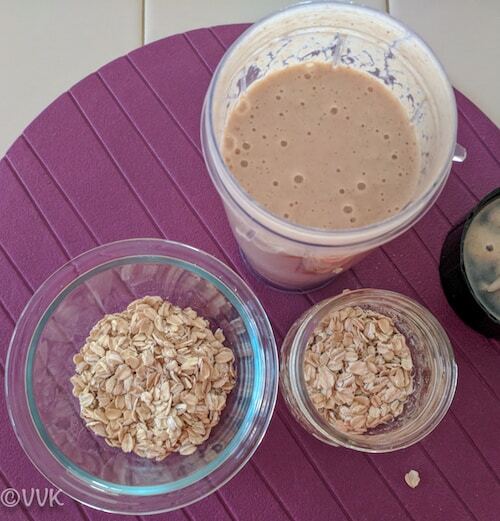 So made a milk smoothie with banana and almond butter (I know this can make an excellent smoothie on its own) and then I let the oats to soak in this yummylicious smoothie. Then topped it up with more almond butter, chia seeds, and fruits. Sounds delicious right? I assure you it tastes delicious too, even if I may say so myself. You can find this delicious nut butter in your local Walmart stores in the jam/spreads aisle. 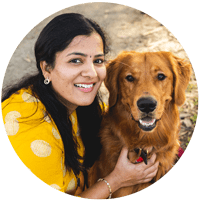 Now you can earn cash with this Ibotta offer as well. All you have to do is grab your coupon and head to your nearest Walmart store and make this recipe. 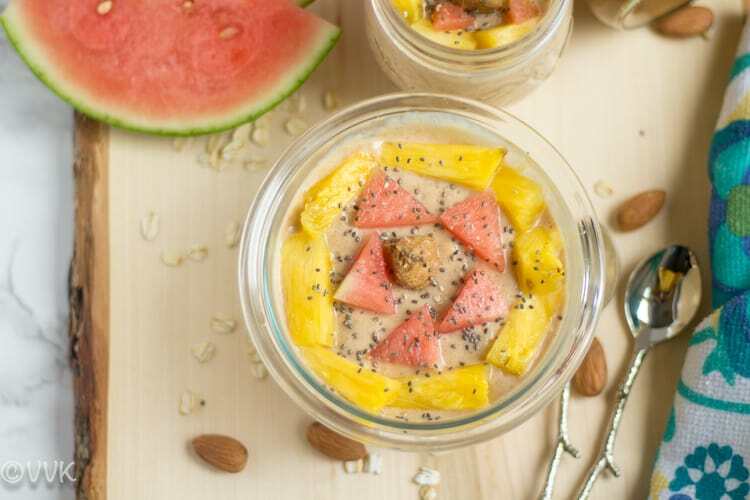 As I always say, the sky is the limit for overnight oats recipes. 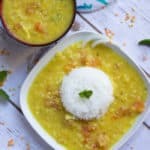 You can play with ingredients as per your preference. Also, you can use the nut butter in any smoothies, and for cookies and even in savory recipes like udon noodles. 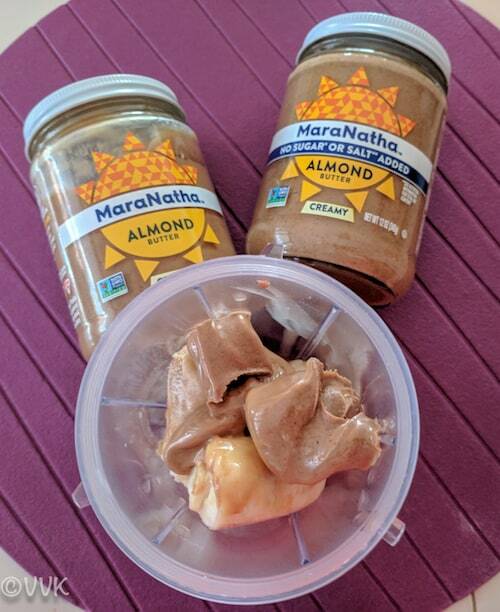 This nut butter is a perfect snacking option during hunger pangs as well. 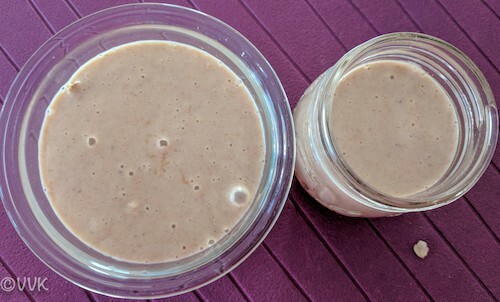 Now without any further delay, let me share the overnight oats recipe. 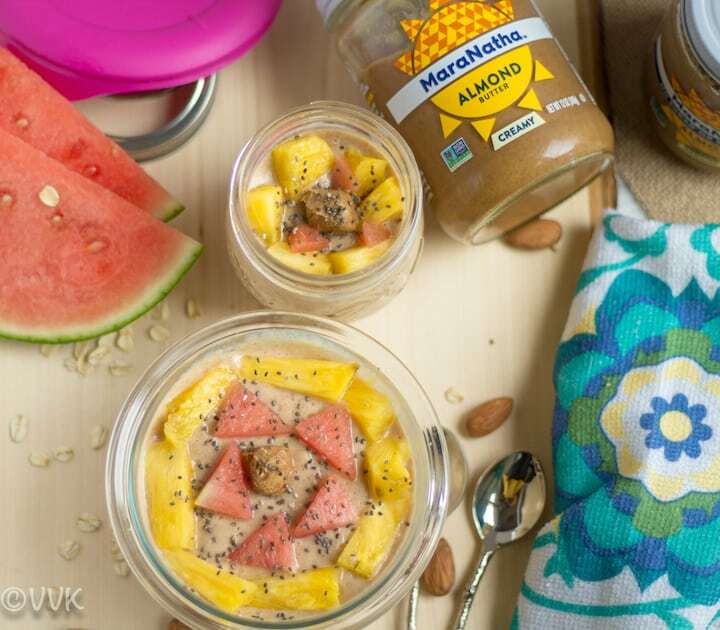 A healthy and delicious breakfast recipe with oats – overnight oats with MaraNatha almond butter and banana. Peel the banana and chop them roughly and add it to the blender. To this, add the almond butter. Take 1/4 cup of oats either in a mason jar or any container of your choice. Add an equal portion of banana almond butter smoothie over the oats and close it. Refrigerate the prepared oats. Before serving, top it up with your favorite fruits. I used pineapples and watermelons. Drizzle the chia seeds and also add a dollop of almond butter and enjoy! You can add nuts or fruits of your choice. Instead of the banana smoothie, you can prepare the smoothie with avocado or apple or even pear. Instead of regular milk, you can try almond or cashew or soy milk. I did not add any additional sugar to this recipe. But if required you can add sugar or honey. 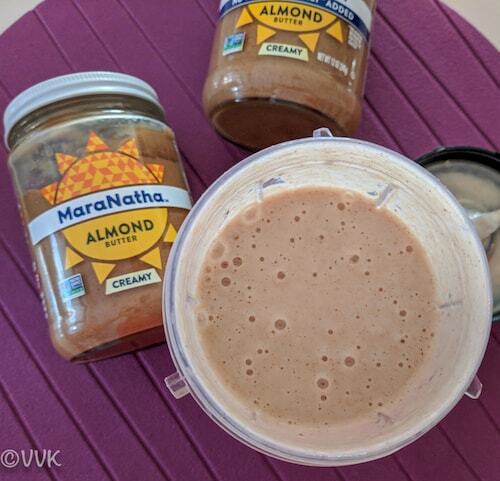 A healthy and delicious breakfast recipe with oats - overnight oats with almond butter, precisely MaraNatha Almond Butter and banana. You can add nuts or fruits of your choice. Instead of the banana smoothie, you can prepare the smoothie with avocado or apple or even pear. Instead of regular milk, you can try almond or cashew or soy milk. I did not add any additional sugar to this recipe. But if required you can add sugar or honey.